Habitat builds simple but decent housing with and for families who live well below the poverty level. To be eligible, prospective homeowners must either reside in substandard housing or spend more than 30% of their income on housing. 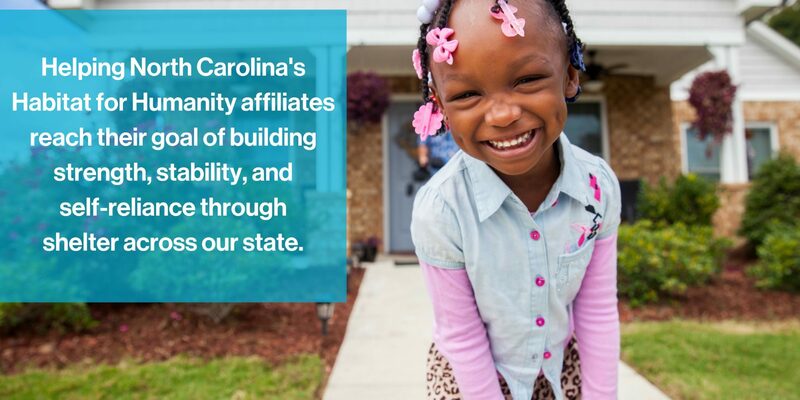 Since opening its first affiliate in Asheville in 1983, Habitat has built 7,101 new houses in North Carolina. Affiliates across our state have rehabbed another 446 homes for first-time homebuyers. With the addition of critical repair of homes, the total number of families served over that time is 9,420 — and counting — through the end of June 2015. North Carolina has built the greatest number of Habitat homes of any state in the US, aside from Texas and Florida. Habitat represents one of the few homeownership opportunities for families living below 80% of Area Median Income (AMI). It represents the only opportunity for families at or below 50% of AMI. Use the form below to find your local Habitat affiliate, to direct donations to them, or to get involved as a volunteer.